2. Line a baking sheet with foil or parchment. 3. Peel bananas and place onto the baking sheet. 4. Sprinkle with brown sugar and a pinch of salt. 5. Roast for 25-30 minutes or until they develop color and the sugar caramelizes. 7. Place all ingredients into the blender. Make sure to pour in the liquids first. 9. Pour into paper cups. 12. Remove the paper cups. Taking the time to roast the bananas transforms a smoothie into healthy desserts for kids. 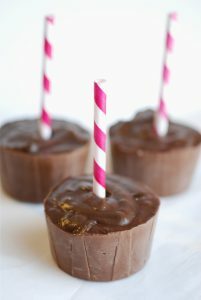 The rich caramelized taste of the roasted bananas with the dark chocolate and peanut butter complement each other so well and create dessert pops that are packed with flavor. Although they have some complexity, these dark chocolate treats will appeal to any child’s palate. Aside from being delicious, this dessert is a great way to get kids in the kitchen. You can invite them in to help make the pops. They can sprinkle the sugar on the bananas, pour the liquid into the cups and taste the ingredients. It is a fun activity to do after school or over the weekend. This recipe is a casual, easy, breezy and fun way to make healthy desserts for kids minus the effort.